Want to become a better steward of nature on your land? These two books will inspire and guide you. 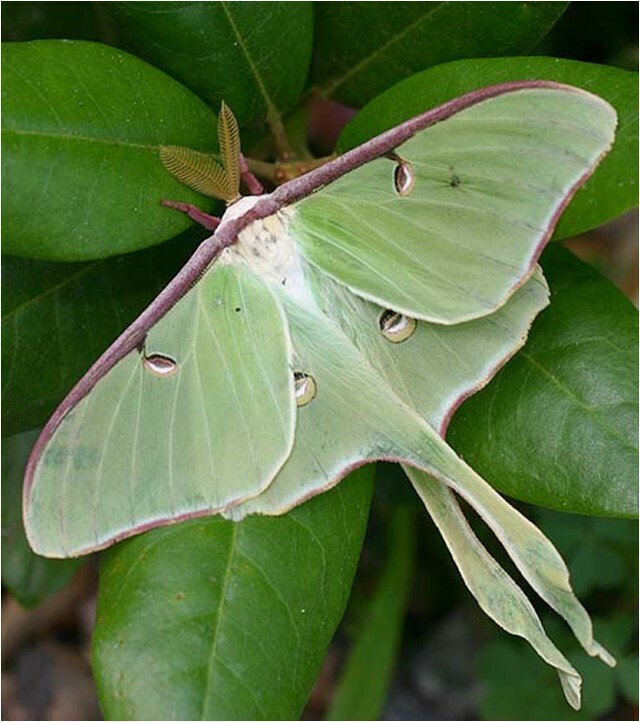 Doug Tallamy’s popular book, Bringing Nature Home: How You Can Sustain Wildlife with Native Plants, taught us to love native plants for the leaf-eating insects they host. 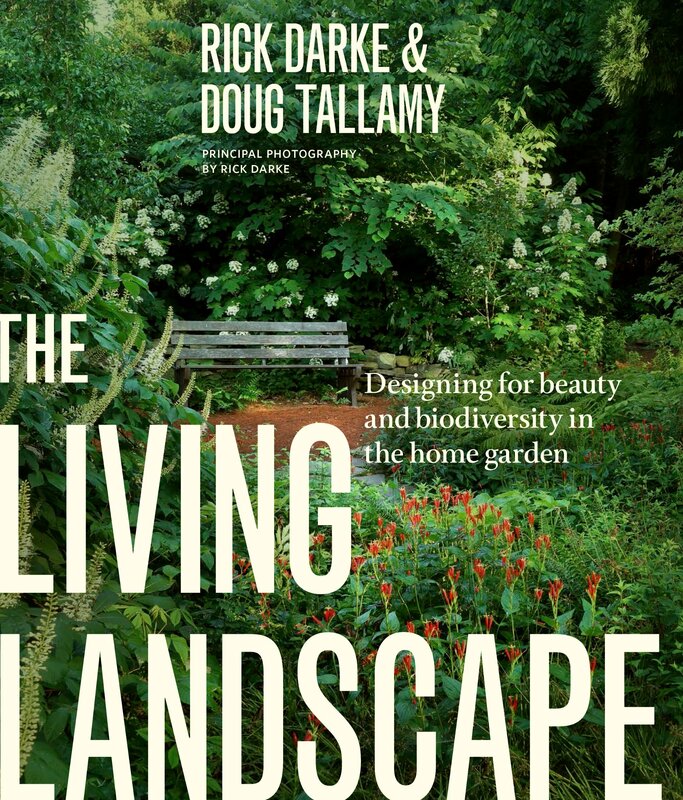 Tallamy has now teamed up with landscape architect Rick Darke on a new book that helps us create aesthetically pleasing landscapes for our native creatures. Heather Holm’s book teaches us to garden for insect pollinators and appreciate the ecosystem roles they play. We can help the environment by what we plant in our yards. These books tell us how. This book is beautiful—so beautiful you can display it on your coffee table. The photographs show landscapes, combinations of native plants, and the creatures who live there. These images inspire us to create esthetically pleasing wildlife habitats that are alive with biodiversity. 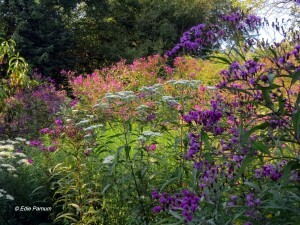 The pictures and text explain how to design for beauty using native plants. Instead of planting them haphazardly, we learn to position and combine natives to create an alluring garden. The authors teach us to imitate natural habitats by planting in layers: ground, herbaceous, shrub, understory, and canopy. 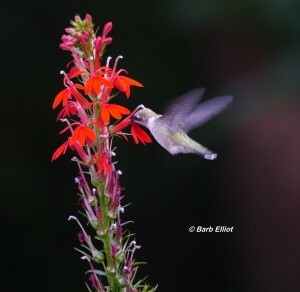 Instead of photos of individual plants, the book illustrates native plants as part of the landscape and showcases the birds, butterflies, and other creatures living there. 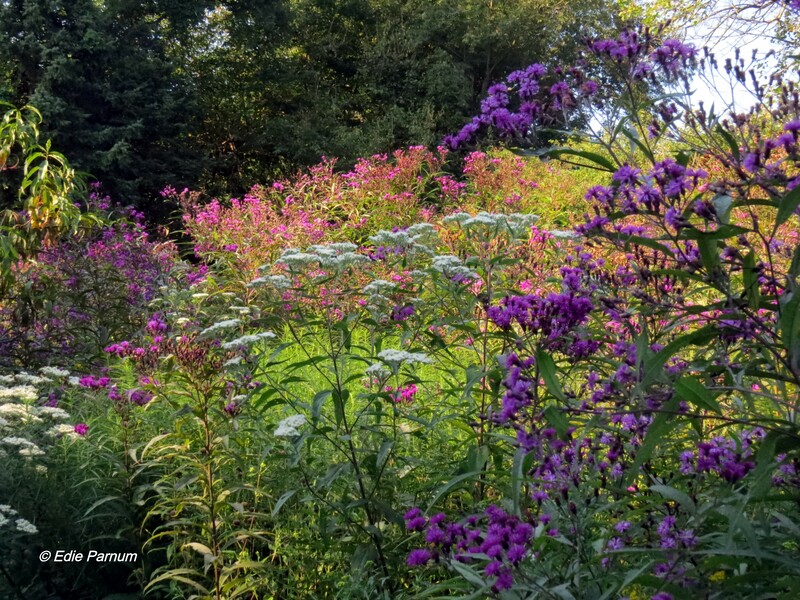 Edie’s meadow landscape, September, 2014. © Edie Parnum. 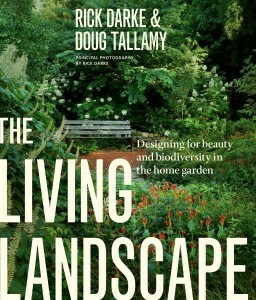 A practical book, low maintenance gardening is emphasized. It recommends pleasing combinations of plants that don’t out-compete each other or require excessive weeding. 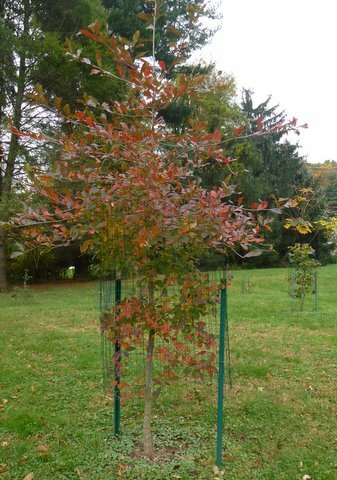 We learn to anticipate changes in our landscapes over time, especially when planting trees and shrubs. The plant lists, organized by geographical area, are superbly designed to help us make plant selections. Symbols concisely indicate the ecological functions for each plant, e.g., nest sites, pollen, nectar, seasonal foods for birds, and food for caterpillars. Other symbols represent landscape functions such as seasonal flowering, fall foliage, fragrance, or groundcover. 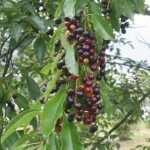 The plant lists also specify the ecological benefits to humans. Not normally emphasized, these paybacks include carbon sequestration, shading and cooling, watershed protection, moderation of extreme weather, and air filtration. Like flowers? 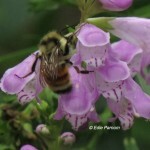 You surely love pollinators, too! You can’t have one without the other. Plus, flowers and their pollinators create seeds, fruits, and nuts—actually a third of the food we eat. Of course, animals of all kinds require these food products, too. 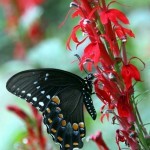 Butterflies, the most charismatic of the insects attracted to flowers, already have fans. Now, with this book, we also learn to value pollinating bees, wasps, moths, flies, and beetles—really! 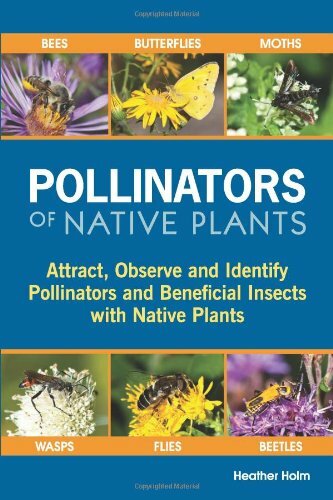 The bulk of the book describes the best pollinator-attracting plants and the interactions between their flowers and the pollinating insects. Insect pollinators are fascinating. We can easily observe and identify them by watching the book’s featured flowers and examining their insect visitors. The excellent photographs in the book help us identify these bees, flies, and other insects. 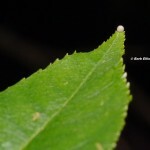 Then we can observe each insect’s strategy as it probes for nectar and/or collects pollen. 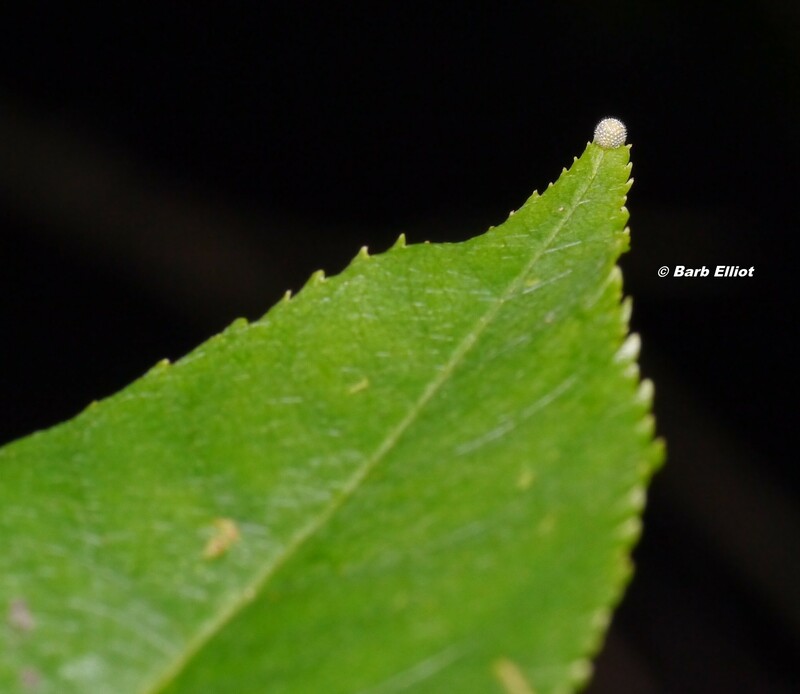 We may see insect interactions like predation, copulation, and parasitization, too. Using this book we home gardeners can select pollinator-attracting plants for the various growing conditions on our properties. 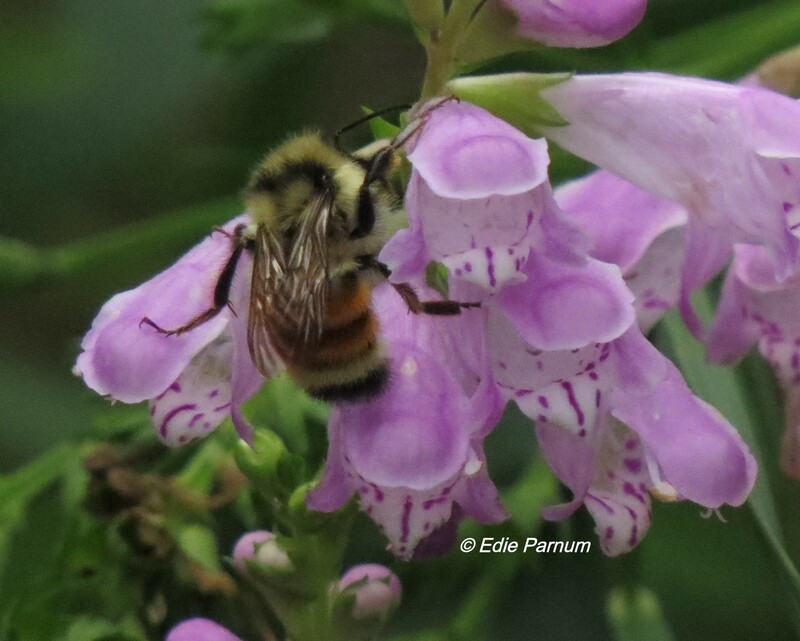 By planting Holm’s recommended pollinator plants and observing pollination in action, we will revel in the flourishing ecosystem we’ve created. I highly recommend both of these books. They will help you beautify your garden and increase its ecological value for all the creatures who inhabit it. I thrust my spade into a patch of my lawn. 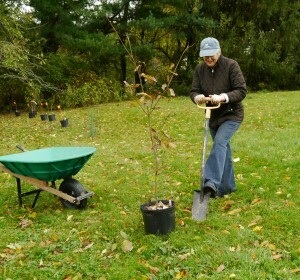 It’s fall, and I’m planting a 4-foot Chestnut Oak. As I dig, I imagine this young tree next spring with its new green leaves. 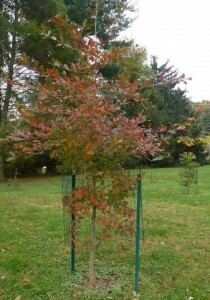 Even as a young sapling, it will host insects and birds. Looking into the future, I imagine this stately native tree a century from now. It has given life to thousands of birds and other animals. My neighbors, I’ve noticed, aren’t thinking about spring. They are clearing their yards of leaves and the dead vegetation from last year’s ornamental plants. They are putting this unwanted garden debris out on the curb along with the cocoons and eggs of next year’s insects. They are getting ready for winter. 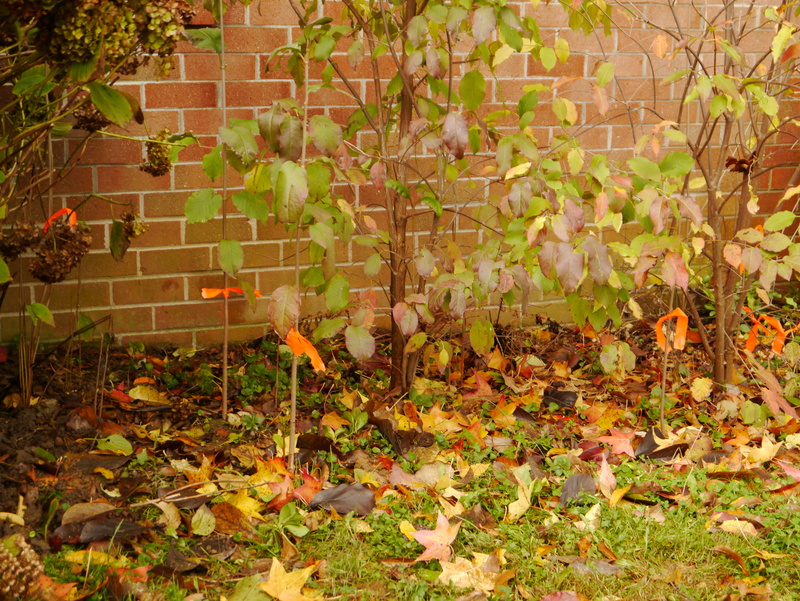 Fall is the best time for planting trees and shrubs, any time before the ground freezes. During the autumn rains, the new plants aren’t asleep. They’re putting energy into their roots for a spurt of growth next spring.This fall, as usual, I will plant several trees and shrubs. When I bought this ¾-acre property five years ago, it was mostly grass with just a few trees, mostly non-natives. Since then I’ve planted 39 native trees and 45 native shrubs. It’s still not enough. 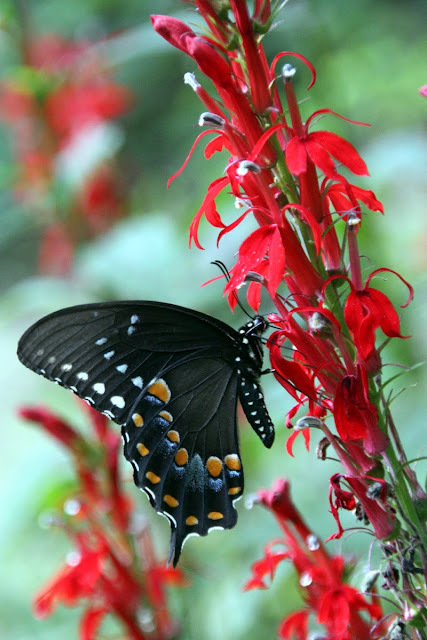 I keep planting native woody plants because they support wildlife. 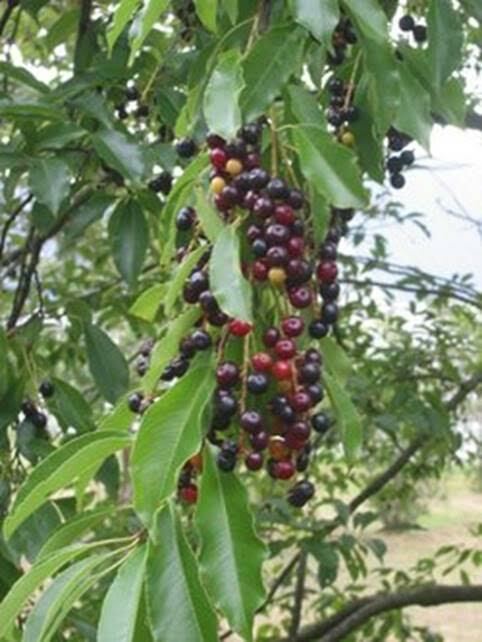 Certainly non-native woodies offer fruits birds will eat—witness the bird-spread proliferation of invasives like Multiflora Rose, Burning Bush, and Japanese Barberry. Natives, however, offer fruits of optimum size and superior nutrition. The fruits of the dogwoods, blueberries, winterberries, viburnums, spicebush, and sassafras I’ve planted ripen just in time to nourish hungry migrating birds in fall. Now in late October most of the berries are gone—consumed by thrushes, catbirds, mockingbirds, waxwings, and warblers. 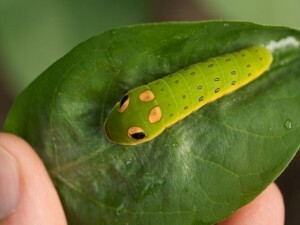 The caterpillar of the Spicebush Swallowtail butterfly uses Spicebush or Sassafras as its host plant. USFWS Photo by Ryan Hagerty. that native plants host 29 times more of the native insects essential for our birds. 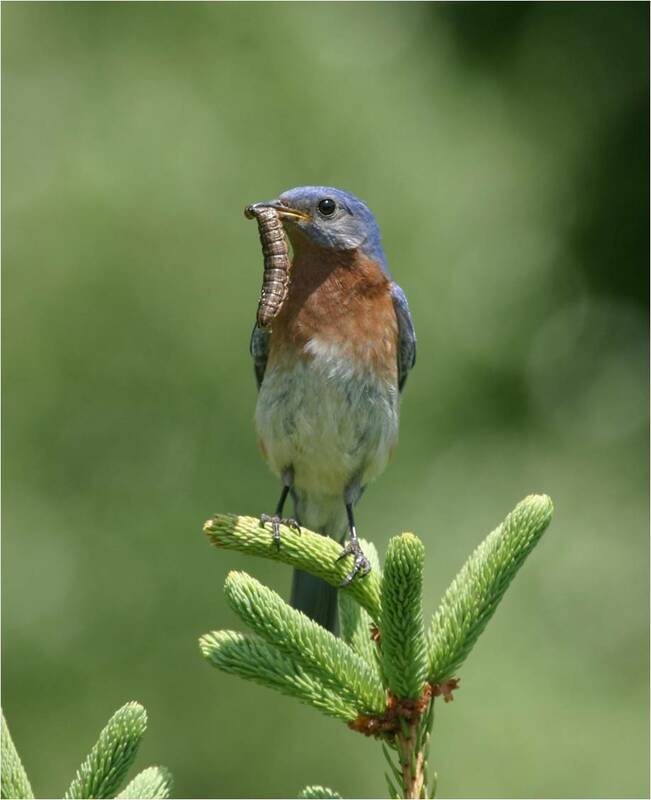 After all, 96% of terrestrial birds feed their young exclusively insect food. This year to augment what I’m already growing, I’ll plant ten small trees and shrubs. I’m planting the Chestnut Oak, Quercus prinus (according to Tallamy, oaks host 534 species of caterpillars); American Elm, Ulmus Americana (hosts 213); and Pawpaw, Asimina triloba (host plant for Zebra Swallowtail butterfly, a species I covet for my yard butterfly list). Planting a tree or shrub is easy. For my Chestnut Oak and the other trees and shrubs, I don’t need to dig a huge hole. I make my hole only as deep as the soil in the plant container and twice as wide. After putting the plant into the hole, I make sure the soil line of the plant is level with the ground. Then I use the soil that was removed from the hole to fill in around the plant. Because my oak is a local native adapted to our soil, I am not tempted to add special topsoil, fertilizer, or any other enrichment. That would stimulate fast but weak growth. A hole filled with artificially enriched soil encourages the roots to stay confined rather than to reach into the ground below for nourishment. Next, I push down on the loose dirt with my hands, but avoid stomping on it with my feet. I spread a one-inch layer of my compost (last year’s leaves and garden debris) on top to provide some extra humus not available in the turf grass. Then I give my oak a good watering. That’s it for this tree. I’m ready to plant more. Newly planted trees and shrubs may need extra water. During any week without significant rain, I put a leaky watering can next to each plant and let the water drip slowly into the soil. A 1-2” layer of mulch will help retain the moisture, but I never let the mulch touch the trunk. Once established, these woody plants, situated appropriately for light and moisture, should thrive without any additional help from me. The trees and shrubs I plant are usually small. They are cheaper and suffer less transplant shock than a big tree or shrub. These smaller saplings start to grow more quickly and in a few years usually out-compete larger nursery stock. To save money, I also frequently transplant volunteer trees and shrubs in my yard to more appropriate locations. Some of my shrubs—virburnums, for instance—send out shoots that I dig up and plant elsewhere. I also accept gifts from my native plant gardening friends. As I say, there’s always room for more. Anyway, I’m not growing ornamental specimens. The plants can touch each other and offer extra shelter, just as they do in the wild. 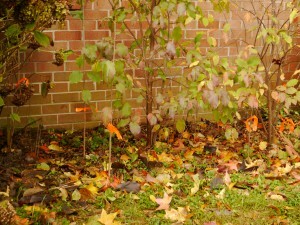 My trees and shrubs are still small, but they already support birds and other wildlife. Next spring I’ll see warblers and other hungry migrants eating caterpillars on the leaves of my native woody plants. The remaining areas of grass are begging to be planted with additional native trees and shrubs. Next fall I won’t resist planting more. 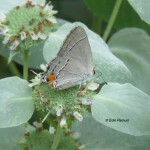 For Doug Tallamy’s list of woody plants supporting butterfly and moth caterpillars, click here. Planting an oak is the single most important thing we can do to support wildlife. As a birder who loves spring migration, I have long noticed that my beloved warblers and other colorful birds prefer the native oak trees. On May mornings, just when their foliage is emerging, I scan the oaks. That’s where I find American Redstarts, Blackburnian Warblers, Scarlet Tanagers and other favorites in their resplendent spring plumage. Only recently have I learned why these birds are in the oaks. 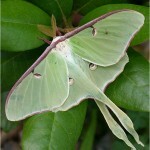 I credit Doug Tallamy, Professor of Entomology at the University of Delaware and author of Bringing Nature Home. 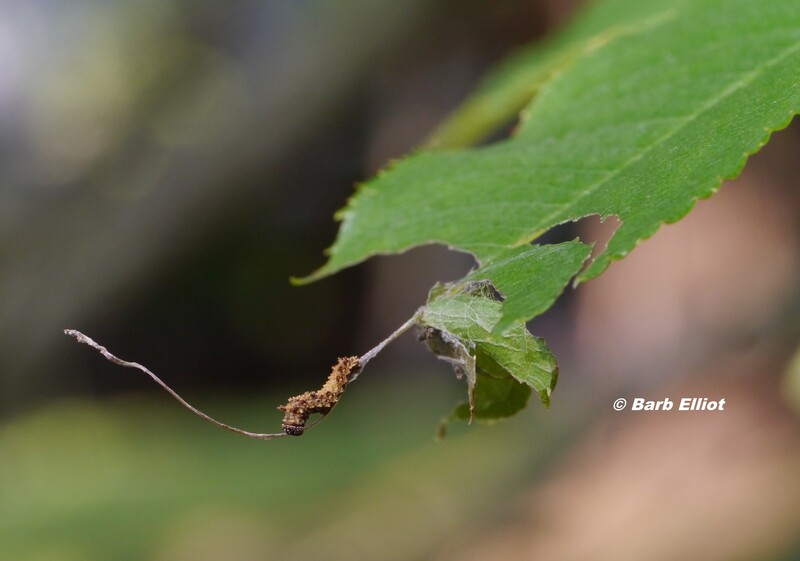 Oaks, according to Tallamy, support 534 species of lepidoptera (butterfly and moth) caterpillars– more than any other native tree or plant. These caterpillars are not only the primary food source for migrating and breeding birds, but are essential food for baby birds. 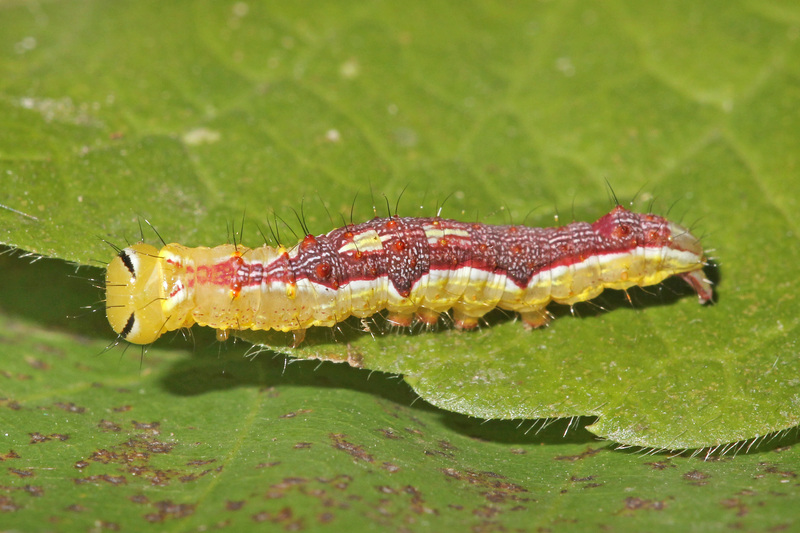 Other native plants support caterpillars, too, but non-native plants host very few at all. I’ve always known that acorns are important food for turkeys, woodpeckers, jays, nuthatches, squirrels, chipmunks and other animals. 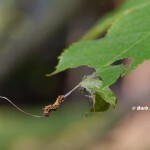 However, birds and other animals are even more dependent on the insects that munch on the oak leaves. 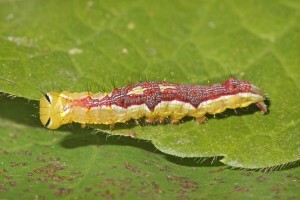 According to Tallamy, in addition to myriad lepidoptera species, oaks host aphids, leafhoppers, thrips, and other bugs–all target foods for animals throughout each growing season. 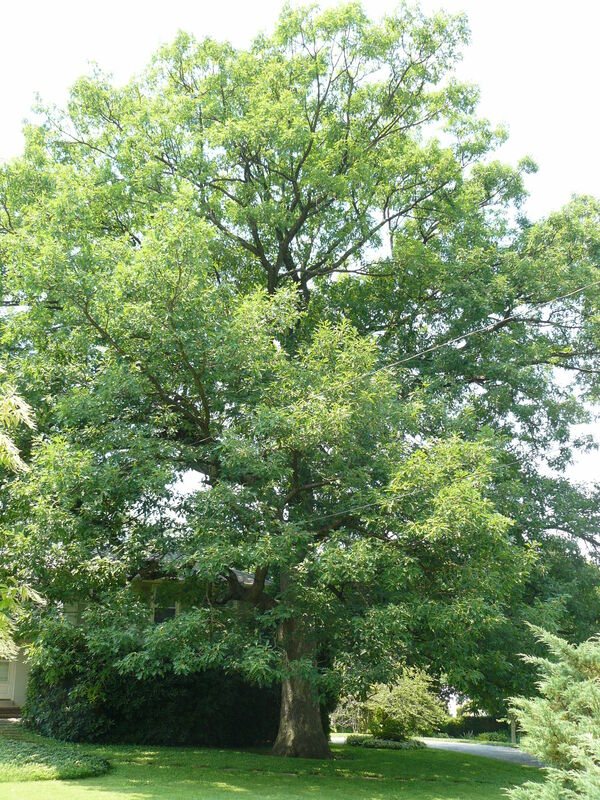 Professional landscapers may try to dissuade you from planting an oak. They’ll tell you it grows too big for the average-sized yard, though most yards are big enough to support a full-sized mature oak. 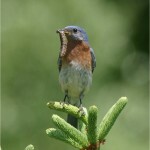 Eastern Bluebird with caterpillar to feed its young. Photo by Jake Dingel, PA Game Commission. Perhaps, without any sense of irony, they will say that an oak will grow too slowly. Certainly most oaks will be small for many years, but even young trees will support lots of insects. While there are many local, native oaks to choose from, the handsome White Oak (Quercus alba) is my personal favorite. From my childhood days in Salem County, NJ, I have fond memories of a nearby magnificent, ancient White Oak. John Fenwick, an early settler, signed a treaty with the Lenape Indians in 1676 under this tree, now approximately 425 years old. This species grows slowly (about a foot per year), but can live for centuries. Other recommended oak species include Scarlet Oak (Q. coccinea), Chestnut Oak (Q. montana), RedOak (Q. rubra), and Black Oak (Q. velutina). These oaks are available at native plant nurseries and native plants sales. Since oaks have long tap roots, choose a small specimen (4’ or less) or grow your own from an acorn. Because they are adapted to our soils and climate, no fertilizer or other amendments are needed. However, regular watering during the first year helps the root system get established. An oak is your personal legacy. Your oak can live for centuries. It will host an inestimable number of birds, insects, and other wildlife during your own lifetime and for generations to come.